On Friday, the California Highway Patrol took to social media to make an usual request. 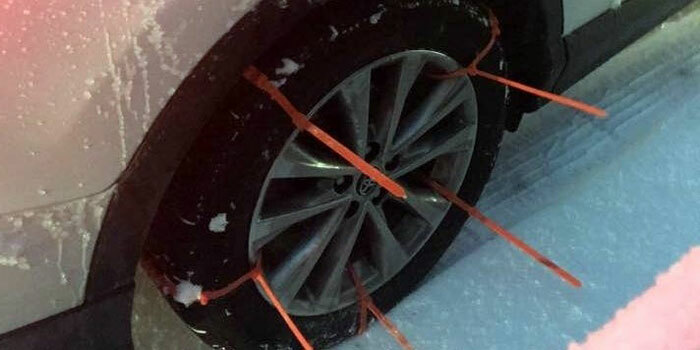 California Highway Patrol said that they encountered a man who had attached five orange zip ties to his car’s tire in lieu of chains to help him drive in the snow. The highway patrol went on to say, “these will not suffice as traction control devices,” as zip ties are not a legal form of traction control in California. During the winter months, motorists may encounter traction chain controls in the mountain areas within California. When chain controls are established, signs are posted along the road indicating the type of requirement. There are three requirements in California. Most involve vehicles having some type of chains on their tires, or having a four wheel or all wheel drive vehicles with snow tires on all four wheels.